Welcome to our website. We are “OSAWA SHOUTEN”, a rice shop in Tokyo. We have been serving non-glutinous rice and glutinous rice since 1918 in Tokyo, Meguro. 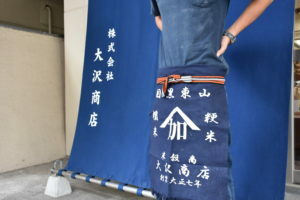 Our customers for non-glutinous rice are restaurants (Sushi restaurants, tempura restaurants, etc) and educational institutions (all of the primary schools and middle schools in Tokyo, Meguro ward, and cooking schools, etc). Japanese confections, known as Wagashi, use glutinous rice. Our products have been officially recommended and approved by the Japanese confection association, Wagashi Kyoukai (see http://www.wagashi.or.jp), since 1973. Our company is one of the only two companies that the Japanese association, Wagashi Kyoukai, has recommended and approved in Tokyo. A large number of Japanese confectionary (Wagashi) makers in Tokyo buy our glutinous rice. Our strength is our cutting-edge technology and traditional methods used to polish rice. Polishing is one of the most important steps. Even high quality brown rice would be completely ruined if not polished correctly. Glutinous rice is more difficult to polish than non-glutinous rice. We have been developing our skills and technologies to look for the best way to polish glutinous rice, and we are proud of what we have achieved. Our techniques and knowledge have also improved how non-glutinous rice is polished in our shop. Food safety and health standards are always our priority. This is why educational institutions are our largest sustainable customer base. Please do not hesitate to contact us if you are interested in our products or have any further questions. We will always do our best to serve you what you are looking for.